Crossing the Gulf of Tehuantepec is one of the most dreaded pieces of sailing in Mexico. The gulf is a narrow isthmus separating the Pacific from the Gulf of Mexico. When northerly winds are blowing in the Gulf of Mexico they cross the isthmus into the Tehuantepec and a narrow gap in the mountains funnels and accelerates the wind. What may be a pleasant 15 knot breeze on the eastern side can become a 40 knot gale on the western. This is an example of a prediction of the Tehuantepec winds (thankfully, not for our crossing of it). These are GRIB files – raw government weather forecast data displayed graphically. This one shows 40-45 knots of wind in the middle of the Tehuantepec. (I keep writing Tehuantepec because I like the way it sounds, although not as much as Topalabampo in the north). That’s enough to create 15 – 20 foot seas at very short periods – ie, boat breaking stuff. We download these images, along with other weather resources to see what we will get whenever we go anywhere. We looked intensely at weather predictions before leaving on the 250 mile (2 day) trip across the Tehuantepec. 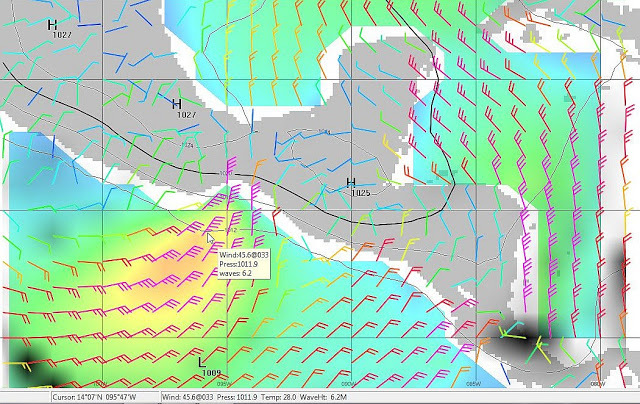 We were hoping to leave Monday morning and our predictions varied but some showed very light winds for the entire trip and some showed a short period of heavier winds Tuesday morning. We decided to brave it and left with one other boat, Wanuskewin with Mike and Holly aboard. Sure enough Tuesday morning, well more like Monday night, just as we were approaching a shallow sandy bar clogged with large fishing boats, the wind piped up. We saw a max of about 35 knots, which is a lot of wind, but we reefed (reduced the size of our sails) and carried on. It only lasted a few hours and for the rest of the trip we had little to no wind. Calm enough catch and filet this crevalle jack on the back of the boat. So those weather forecasters were pretty close to spot on. By Tuesday morning (and by that I mean about 3 am – we sail the boat 24 hours a day, taking 3 hour shifts) we were ready to get into port. It was only about 2 miles away and we were motoring right for it in calm weather. Arrivals after a few days at sea are really rewarding. However, our trials were not quite complete. Suddenly, the boat lumbered to a halt and the engine stalled. Looking over the side, I could see that we were snagged in a large and long fishing net. What was this thing doing strung right across the main channel into a large port? Who knows but the fishermen were soon on the scene and, characteristic of most Mexicans we’ve met, they were not angry and took their loss in stride. They helped me cut the net away and left to salvage what they could of their catch. 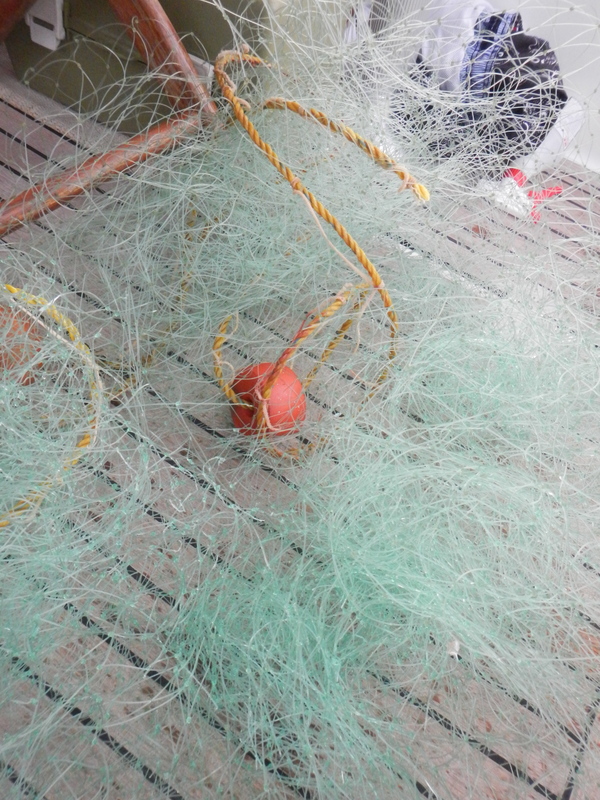 This left a large chunk of net tangled around our propeller, daggerboard and rudders like a fly in a giant spider web. Mary and I anchored the boat in the calm ocean to figure out what to do. Mike and Holly from Wanuskewin witnessed the whole thing from a mile behind us and were super kind to anchor near us and help. 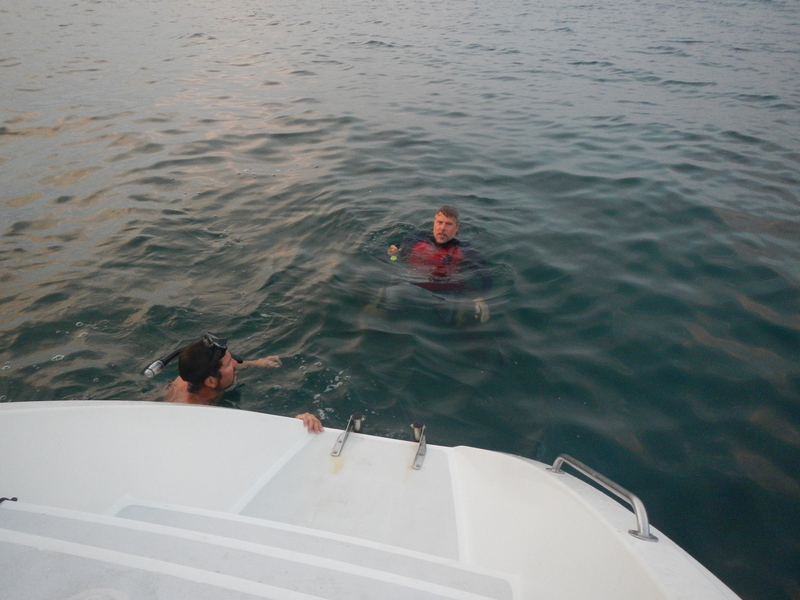 Mike and I dove with snorkels and knives to saw away the remainder of the net that was so tightly twisted around stuff under the boat, being careful not to let it tangle us. After about an hour we had every last bit of it off. We saved what we could to throw out so it would not catch any more sea creatures and mourned the fish who were caught in the discarded net. I kept some of the floats from the net as a reminder of this little battle. This entry was posted in 1st Season, Adventure, Boat Stuff, Mexico and tagged Tehuantepec by Pete. Bookmark the permalink. Nice fish. How’s the fishing been going this trip? 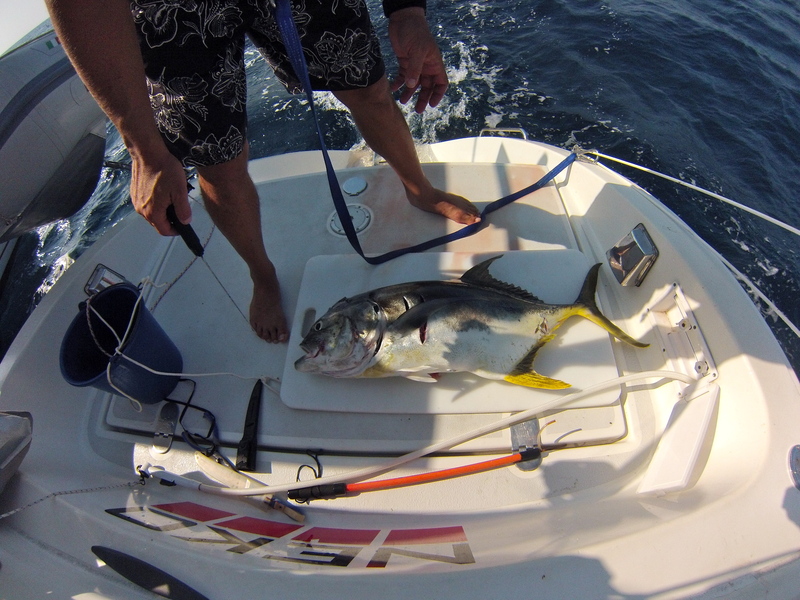 Starting in San Diego, we’ve caught 4 tuna, 1 marlin, 1 4ft shark, 1 bonito and a whole bunch of skipjack. No mahi mahi yet. Released the shark, marlin and all but one of the skipjack (tried to eat him, but he was dark and gamey). This is not bragging because the waters are so fertile here the fish practically jump into your boat. Other people catch a lot more than we do. We have 3 rods – 2 trolling which we put out with squid lures or cedar plugs – and one spinning rod that we use if there are fish in the anchorage. Next is learning to fish with a speargun. Glad that you conquered the T-pec! All so exciting. Glad you have friends around when you need. Hey guys, sorry we weren’t there to help you cast off the lines as you headed South. It was fun sailing with you. I’m pretty sure that fish you caught wasn’t a yellow fin but actually a crevalle jack (that’s why the meat was so red). By the way, I do most of my (successful) fishing with the speargun, and we like grouper and snapper a lot which is what I get mostly … perhaps when we connect next we can go out together. Hope you can land some dorado on the trip down to the bay. Have fun crossing the bar! It sure is empty here tonight! Hey, Mike, thanks for the tip. I am sure you are right. I thought the fish looked a little oval to be a tuna but it had the yellow fins and tail. It would be great to learn how to fish with a spear gun. Looking forward to it.